My name is Chaunte and I’m a jewelryholic. But I don’t want help with my addiction. I know, what a shame to know I have a problem, but no interest in resolving it. How hypocritical of me! I just want to admit that I love jewelry. I mean, I really love jewelry. You see, he doesn’t have to go to Jared. For me, every kiss doesn’t begin with Kay. Buy me a five- or six-dollar necklace from Target and you’re spot on. Fashion jewelry is all I need. There’s something about silver, gold, rhinestones and pearls that make my heart sing. Jewelry, especially a necklace, brings life to a simple T-shirt and jeans ensemble, a button up, or a low neckline top. Necklaces are my favorite and what I own the most of. I have a few bracelets, but because my wrist is so small, it’s usually difficult to find bracelets that fit well. But that’s not a concern when it comes to necklaces. I occasionally splurge and buy a beautifully crafted handmade treasure like the one I recently found online at The Vintage Bar. 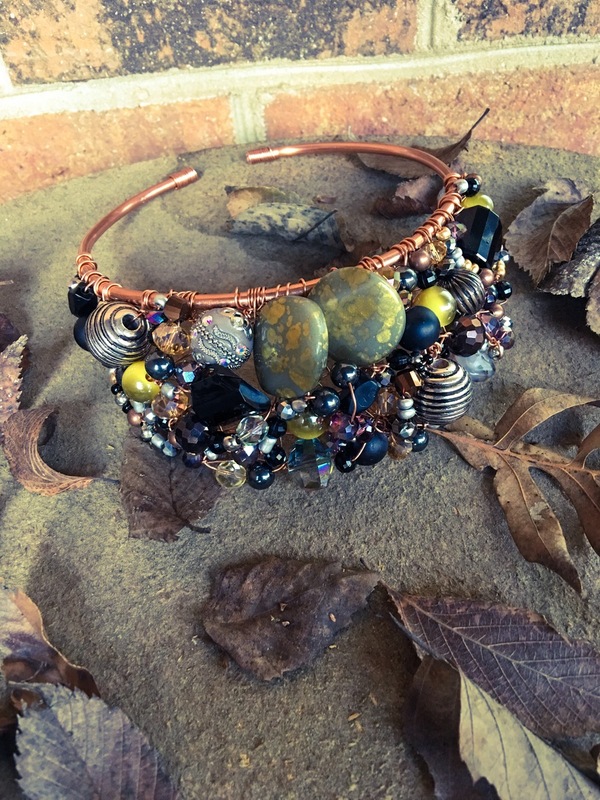 It’s a choker made of copper with a mix of colorful beads intricately designed for a fashionista or a jewelryholic like me. It’s truly a work of art. I don’t even know what to wear with it, but the day will come when Daisy De Santiago (Yeah, that’s her name.) will accent something in my closet. Sometimes I have the outfit first, then I’ll look for jewelry to coordinate with it. Most times the jewelry calls my name and ends up coming home with me. That’s why my armoire is overflowing. I’m Chaunte and I’m a jewelryholic. I know I’m not alone. Admit that you have a problem. If you do, please share tips on how to neatly store your jewelry.